If you’re uncomfortable with the hyperpigmentation of your skin, you can take action to fade it, or even make it go away. Lots of people have freckles, acne scars, age spots, and sun spots. They don’t harm your health, but they may cause you to cringe in front of the mirror. There are lots of ways to treat hyperpigmentation. If you’ve consulted with a dermatologist about it, you know that there are laser and micro-dermabrasion treatments that can take care of it. Of course, with those options come the risk that they might not work, or they might cause other damage to your skin. And visits to a dermatologist aren't cheap, either. If you’re looking for ways to treat hyperpigmentation at home, you have lots of possibilities. All of them require some discipline as it takes weeks of daily or bi-weekly treatments to make the most difficult spots fade. In the meantime, you can wear a full-coverage foundation or other makeup to disguise your blemishes. In this guide to the best treatments for hyperpigmentation, we’ll review the top products that brighten skin tone, erase sun damage, and knock years off your face. But first, here’s some helpful information about what works. A dermatologist can talk to you about pigmented lesion lasers, of which there are at least three kinds: green light, red light, and near-infrared. There are other in-office treatments like dermabrasion and chemical peels, plus prescription-strength topical medications. These may leave your skin irritated and red for a few days, and you’ll probably need to return for multiple doctor visits. At home, you can use your own dermabrasion devices, apply a peel or an exfoliating masque, use creams that lighten your skin tone, and serums that brighten your face and even out your coloring. One popular solution that actually works, but takes time to show results, is Vitamin C. Using a Vitamin C serum on your face will gently exfoliate dead, dry skin, calm inflammation, and speed up healing of acne breakouts. This process of removing old skin and stimulating new growth fades discolorations. Hydroquinone is another option that works faster than Vitamin C. It’s the only skin lightening treatment officially approved by the FDA, but natural Kojic acid has a similar effect without some of hydroquinone’s side effects. Hydroquinone whitens, or bleaches, skin cells and prevents melanin, or skin pigment, from forming. A serum with a 2% solution of hydroquinone may take up to 2 to 3 months to fade a dark spot. Alpha hydroxies like lactic , trichloroacetic,and glycolic acid exfoliate dead skin and help new skin to grow, so as to fade freckles and other skin discolorations. Vitamin A in the form of retinol and tretinoin reverses skin discoloration and wrinkles, too, but it can make your skin sensitive to sunlight if you use it in the daytime. Antioxidants like Vitamin C, E, and niacinamide (Vitamin B3) help even out skin color and reverse the damage that the sun does to your skin. You can probably guess that while you’re trying to fade skin discoloration, you should protect your skin from exposure to sunlight. Not only will your skin be sensitized from the treatments, you can undo all your hard work in one day if you’re unprotected outdoors. One, when you begin treatment to fade hyperpigmentation, always wear sunscreen. Follow the directions—if the sunscreen says to re-apply after a certain amount of time or exposure to water, do it. Otherwise, the sun will darken your skin all over again. Two, overusing skin bleaching creams can cause the opposite effect of what you want. Too much hydroquinone can make your skin look older and discolor it permanently. You do not want ochronosis. Skin bleaching creams need to penetrate your skin. Once or twice a week, exfoliate gently by physical or chemical means—use either a loofah, or a scrub or peel with glycolic or lactic acid. We included a few of those products here to help you. 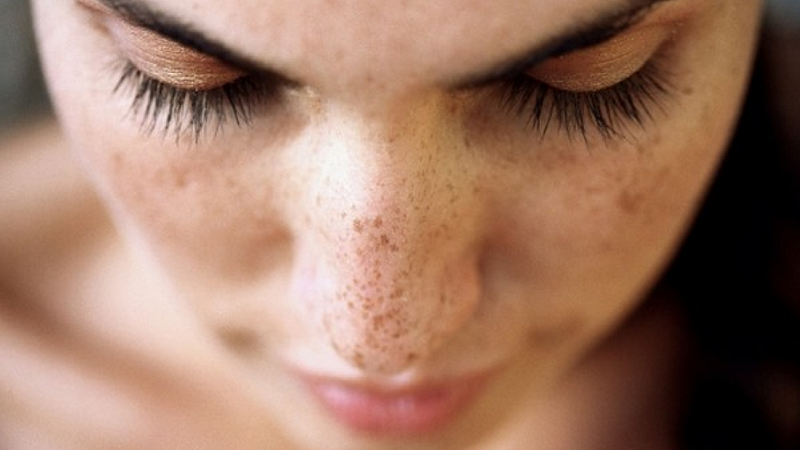 Now let's see the best (at-home) treatments for hyperpigmentation. If you have normal skin that’s not super-sensitive, this first product is very good at fading blemishes. Paula’s Choice Resist Triple-Action Dark Spot Eraser is based on 2% hydroquinone to lighten skin. It also has glycolic acid to exfoliate and Vitamin E to soften and nourish. This cream works for all skin tones and is best suited for normal to dry skin. Paula’s Choice recommends applying it once or twice a day to clean skin after you’ve put on toner. Please avoid using benzoyl peroxide at the same time. Results should appear after 8 to 12 weeks of use. Users report seeing a change in the appearance of their skin tone after just one week of use twice a day. It can be used on face, hands, or chest. Murad Rapid Lightening Serum is based on 2% hydroquinone, glycolic acid, and Hexapeptide-2. It lightens dark spots, slows down the formation of new ones, and exfoliates dead skin cells. Murad says that 85% of the people who participated in their clinical trial saw freckles begin to fade in just a week. Murad recommends using their whole skin care lineup for maximum best results. They say you can use this particular product daily for conditions like melasma, or stop using it once you’ve achieved the results you desire. Murad’s Advanced Active Radiance Serum contains a variety of ingredients that brighten skin tone without hydroquinone, like glycolic acid, Vitamin C, and Vitamin E, plus herbal extracts like tea seed oil (rich in antioxidants), and myrtle, a natural source of salicylic acid. The Active Radiance Serum is gentler than their Lightening Serum, but it’s also not as powerful. Admire My Skin’s description says their Dark Spot Corrector has the maximum concentration of the whitener hydroquinone allowed in an over-the-counter product. It just so happens that it’s 2%, the same as the others we reviewed above. The promise you’ll see results in 4 weeks if you apply it every night. The Dark Spot Corrector also has Vitamin C, Salicylic Acid, Azelaic Acid, and Lactic Acid. The acids encourage dead skin to peel away so new, brighter skin is revealed. Admire My Skin warns that some people with sensitive skin may experience a “slight burning sensation,” so it’s best to begin treatments by applying it every third day until you become accustomed. Advanced Clinicals Brightening Cream is made with Vitamin C, ferulic acid, aloe vera, coconut oil, tea leaf extract, glycerin, and Vitamin E. Not only does it fade freckles and sun-damaged spots, it hydrates skin to make it look younger and feel softer. You can use it on your body as well as your face. The formula has no parabens and is cruelty-free. Again, it may not work as fast or as well as a treatment with hydroquinone, but it’s gentler on skin. MD Complete’s Dark Spot Corrector comes with a bottle of Retinol Vitamin C Booster because the two formulas work together to even skin tone, fade dark spots, and erase fine lines and wrinkles. The corrector has 2% hydroquinone plus Vitamins B and E, niacinamide, black raspberry, and pomegranate fruit seed extracts. The Retinol Vitamin C Booster speeds up skin regeneration. It also contains Vitamin E and niacinamide plus macronutrients. Since retinol makes skin sensitive to sunlight, definitely wear a sunscreen during the daytime outdoors. If you like natural and organic products, TruSkin Naturals Vitamin C Serum is designed to take care of the most sensitive skin. It helps lighten age spots and fade acne scars, plus prevent new acne outbreaks and shrink pores. The serum is cruelty-free, and composed of 98% natural, and 72% organic ingredients. There are no petroleum derivatives, no sulfates, no parabens, no phthalates, no GMOs, and it’s pH balanced to protect skin. The Salicylic Acid 20% Gel Peels are a natural, chemical-free way to get rid of dead, discolored skin as fast as possible with the least amount of damage to your face. The package contains enough for up to 20 full facial peels. A side benefit of this product is that not only does it help lighten skin discolorations, it also clears up acne breakouts and prevents new ones. ASDM Beverly Hills Peels have a 40% concentration of lactic acid. This exfoliator is considered to be kinder to skin than salicylic acid, and it’s great for those who have an allergy to aspirin. Do check with your doctor before using them if you already take a Retin-A product. Olay’s Regenerist Luminous Tone Perfecting Cream isn’t nearly as expensive as some similar products, but users report positive results with diminished discoloration within days. It’s formulated with Olay’s proprietary PearlOptics technology to fade sun spots, dark spots, age spots, and blemishes. Besides helping your skin achieve a more even tone, it takes years off your appearance by moisturizing and helping fine lines disappear, too. You can use it both day and night, and under makeup if you like. AHAVA, an Israeli company, has fans all over the world. Their Extreme Radiance Lifting Mask combines fruit acids and other natural ingredients to give your skin a facelift for more radiance and a younger look. Users reports that it gives them a more balanced skin tone, too. Neutrogena’s Microdermabrasion System is an inexpensive way to mechanically exfoliate at home. It comes as a complete kit, but you can purchase additional puffs separately. The puffs that attach to the device are covered in tiny crystals and skin purifying ingredients. Turn on the device and it’s like giving your face a light massage while you shed old, dry skin. The nice part is that the results are immediate. And over time you’ll see an improvement with reduced dark spots. The PMD, or Personal Microderm System, is a step up from the Neutrogena system. It’s for use only one time each week. It is a handheld exfoliator that comes with a variety of discs. The discs range from 1 white for training or ultra-sensitive skin, 2 grey for very sensitive skin, 2 blue for sensitive skin, and 2 green for moderate skin. The device gently suctions skin toward it so the discs are more effective at exfoliating dead skin. If you’re familiar with using facial scrubs, the PMD does similar work, but on a more precise scale. It can unclog pores, even out skin tone, fade dark spots, and erase fine lines. Skin looks more radiant after each use. Be aware that users recommend following directions and only using the PMD once a week. It’s much more powerful than conventional methods for exfoliating. It has no oils, no fragrance, and no parabens. The untinted version comes out white from the bottle but applies clear on the skin. There is also a tinted version that helps hide skin discolorations. EltaMD recommends reapplying the sunscreen every two hours. We hoped we helped you discover the best treatment for hyperpigmentation. It takes time to fade discoloration and brighten skin tone, but it’s possible. Check back with us again soon to see new reviews of the best in beauty and personal care.